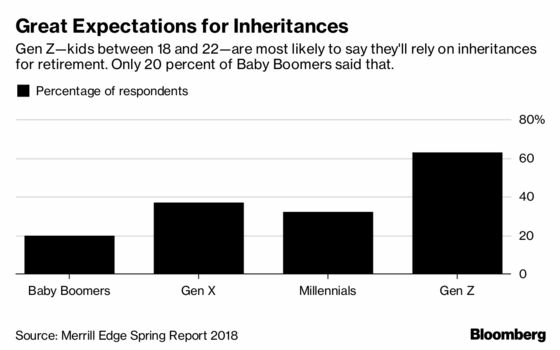 (Bloomberg) -- At first glance, it may look like brazen entitlement: Sixty-three percent of affluent children between the ages of 18 and 22 say financial stability in retirement will depend on inheriting money. As in, the money their parents spent a lifetime accumulating—or, given increasing income inequality, inherited themselves. Before you start growling, consider that this may be a signal of desperation, not greed. The rise in student debt, increased life expectancy and the many competing priorities for money that are considered the “new normal” for younger generations have them wondering how they will pay for it all. According to Aron Levine, head of Merrill Edge, which commissioned a survey of 1,000 “mass affluent” Americans, these young people view inheritance as a sort of safety net. Yes, cue the tiny violins—this is desperation among the mass affluent, who presumably have a leg up on much of the population in terms of education, savings and job prospects. The survey defined this demographic as people age 18 to 40 with investable assets from $50,000 to $250,000, or with investable assets between $20,000 and $50,000 and annual income of at least $50,000. Those older than 41 with investable assets from $50,000 to $250,000 qualified, too. Not only are more members of Generation Z (the ones in their late teens and early 20s) betting on an inheritance, but more think it may come from someone other than their parents. Some 17 percent think it could come from friends, compared with 4 percent of people of all ages. Meanwhile, 17 percent are betting their grandparents have something in store for them, compared with 6 percent of everyone polled. And 14 percent of Generation Z members say extended family will shell out some cash, versus 5 percent overall. Now, it’s true that a boatload of money is expected to be passed to younger generations in the next few decades. In North America alone, an estimated $30 trillion could find its way to heirs over the next 30 or so years. Those beneficiaries may have to wait a long time, though: A recent survey from UBS Financial Services showed that 53 percent of people with more than $1 million in investable assets expected to live to 100. The prospect of such a long life could curb the urge to give more money to loved ones while still living. Levine attributes the relatively large number of Gen Zers who expect to inherit money from friends as unique to the demographic. They’ve grown up in a sharing economy—think Airbnb, Uber and crowdfunding—so “why wouldn’t you have some sort of shared way with friends to finance your future?” he said. The reliance on a hoped-for inheritance points to worries bedeviling Americans who aren’t even struggling to get by. Decades of spending down savings during retirement loom, and safety nets such as Social Security and Medicare don’t feel so safe anymore, particularly to the youngest Americans. Globally, inheritance expectations among a broad sample of workers are highest in India (19 percent) and lowest in Japan (7 percent). 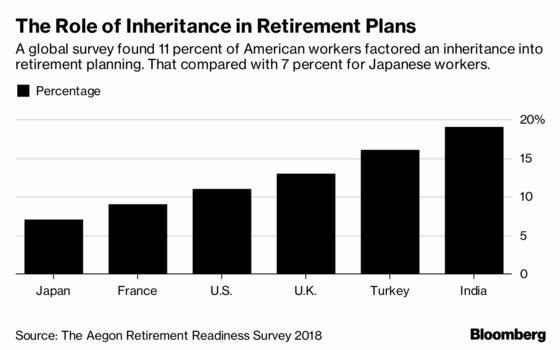 The average across 15 countries in the recent Aegon Retirement Readiness Survey 2018 was 11 percent, which was also the percentage of U.S. workers surveyed who factored an inheritance into their retirement plans. So it’s not just Americans hoping someone else’s money will help fuel a comfortable retirement. While much of the world’s wealth is accumulating at the top, the longing for the peace of mind that money can bring cuts across all social classes and borders—especially in uncertain times.